Until the late 1800s and early 1900s, warfare and headhunting were considered vital activities to the success of many Bornean tribal groups. While warfare was associated with the expansion and protection of territories and assets, the taking of enemy heads was an intrinsically ritual act intended to harness the power of the human soul. This sacrificial undertaking was important for the initiation of male warriors, to ensure fertility and renewal, and for the appeasement of malevolent spirits inflicting harm upon communities. 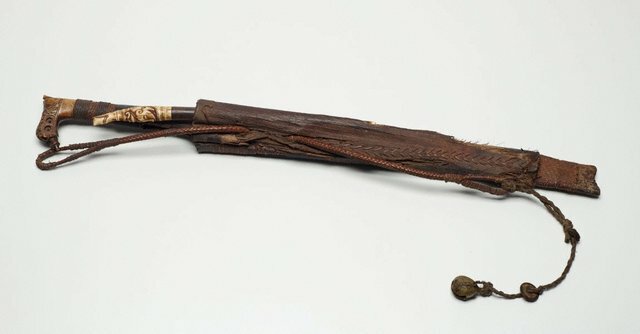 Once considered an essential weapon and symbol of a successful warrior, the ‘mandau’ swords or ‘parang ilang’ manufactured by the Apo Kayan groups of the upper Mahakam region are now considered prestige items and feature prominently in ceremonies and festivals. The examples here combine expertly forged blades with elaborate bone hilts carved with sinuous designs of openwork spirals, foliate forms and protective creatures. They are often further embellished with tufts of human and animal hair as well as precious gems or coins. The ‘mandau’ swords are paired with sheaths ornamented with carvings and braided rattan. In this example, a secondary scabbard (‘apis’) accommodates an additional smaller blade (‘piso raout’) said to be used for removing the flesh of the victim’s head. Christopher Wilson, pre 1989-1996, Sydney/New South Wales/Australia, possibly purchased in Sarawak, Malaysia,1985.